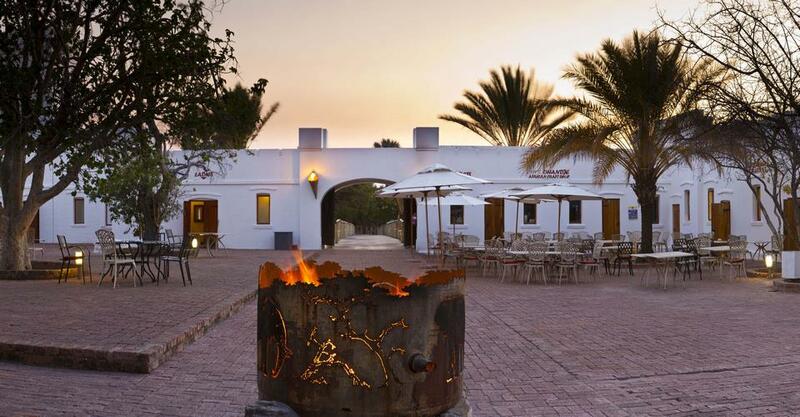 Namutoni camp is on the eastern side of Etosha and derives its name from the old German fort. 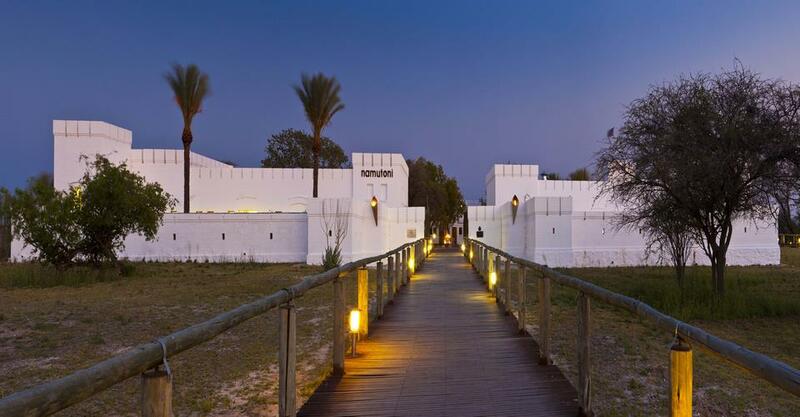 The presence of the fort gives Namutoni more character than the other rest camps in Etosha. Namutoni is the closest to Fisher’s Pan. The pan is a renown wonderland of water birds in the wet season including breeding flamingos. The Fort overlooks the King Nehale waterhole. It is the hub of activity in Namutoni. There are two restaurants, a relaxation lounge, a bar, crafts boutique, curio shop, and bookstore. An elevated decked walkway along the water-hole provides views of the surrounding scenery, wildlife, and spectacular sunsets. Double Rooms: accessed along wooden walkways. There is a private area both at the front and from the bathroom. Equipped with a fridge & tea station. Bath and shower in a bathroom. There are no BBQ Facilities available at these rooms. 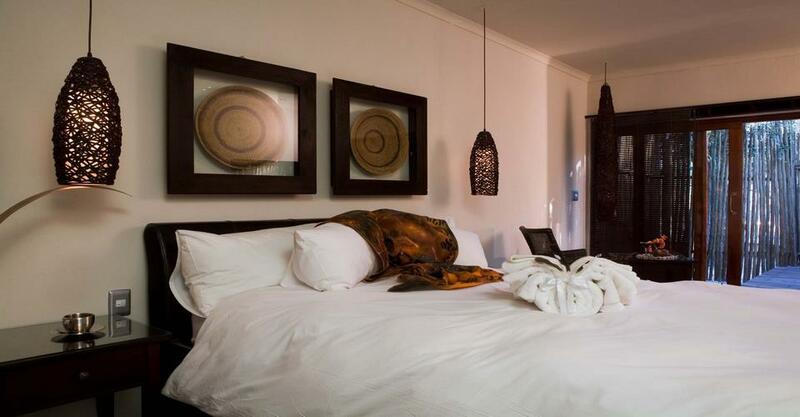 Bush chalets are spacious and private. 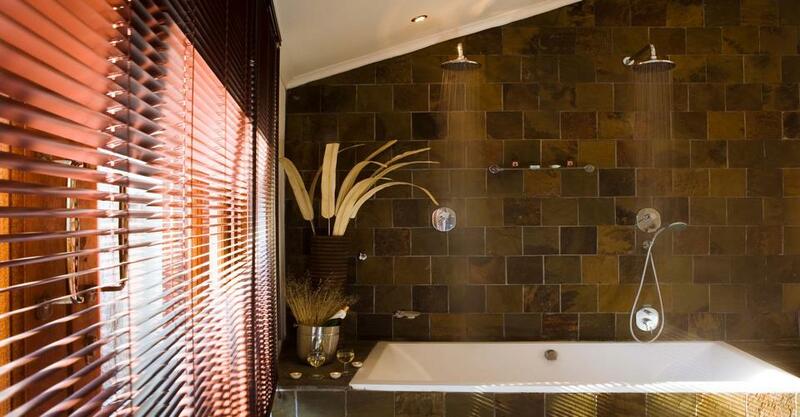 There is the luxury of a double shower and basin. Sliding doors give access to a relaxation area in the front of the chalet. The bush chalets are with a fridge and tea station. There are no BBQ Facilities available at these chalets. There is a 20 x bush chalet (2 beds). There are also 24 x double rooms. You are welcome to book camping at Namutoni Camp. 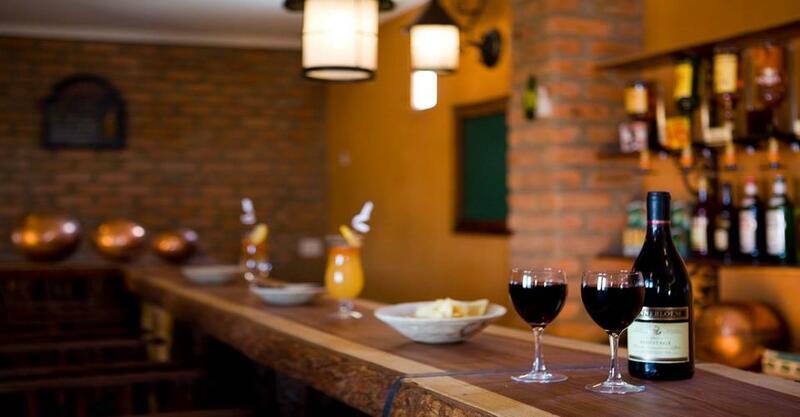 There is Bar facilities and a Restaurant. 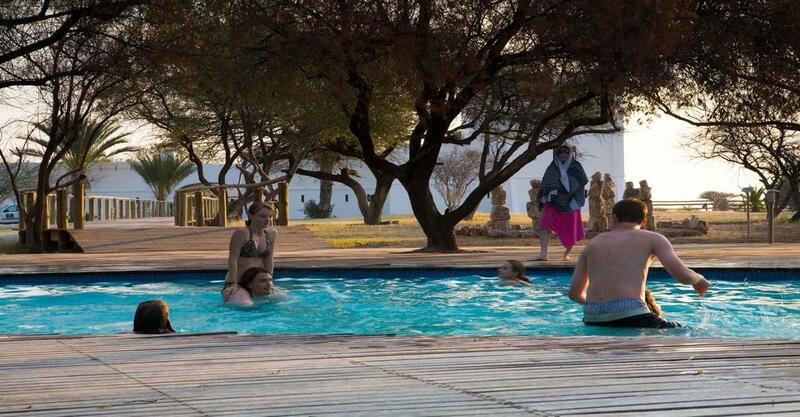 The Swimming pool is a favourite activity at Namutoni Camp. The Waterholes near Namutoni Camp. Chudob: Fed by an artesian fountain this waterhole has a floating reed island. You should find Eland here along with Giraffe, Elephant, Warthog and Black Faced Impala. Groot Okevi: Ground water level spring. Elephant, Gemsbok, Kudu, even cheetah and Leopard. Kalkheuwel: A favoured waterhole of photographers. You can get good close-ups of the animals at this busy waterhole. There is Lots of game here and also an excellent birding waterhole. Common sightings are bateleur eagle, black-breasted snake eagle, tawny eagle and the black (yellow billed) kite. Klein Okevi: Groundwater level spring. Black Faced Impala, Elephant, Giraffe, Lion, Kudu, Gemsbok, Zebra and even Cheetah are typical at this waterhole. Klein Namutoni: An artesian spring about 2km south of the camp. Excellent game viewing especially early morning and late afternoon. 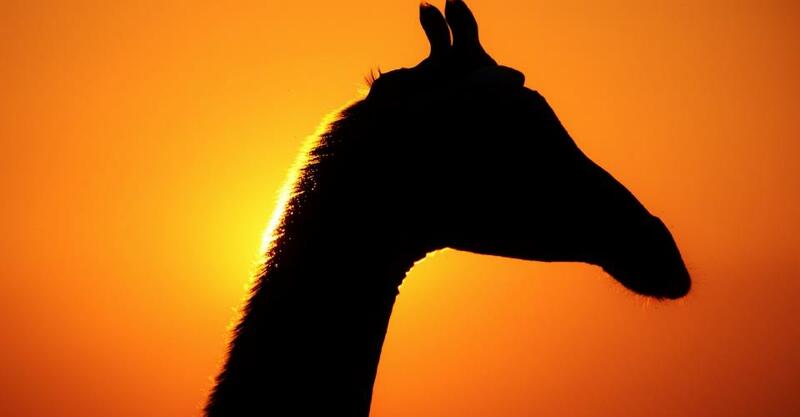 Popular with Elephant, Giraffe, Kudu, Gemsbok, Kudu, Black Faced Impala, Zebra. Don’t miss taking a tour around Dikdik drive where you have a good chance of spotting the tiny and often elusive Damara Dikdik. Koinkas: Game reasonably frequents fed by an artesian fountain. Namutoni: An artesian spring on the western side of the camp. Dense reeds. Ngobib: The waterhole is in a hollow. Not very visible, but does attract Elephant, gemsbok, kudu zebra cheetah and leopard. Okerfontein: A strong contact spring on the edge of the pan. Not very popular, but the lion and cheetah are regular visitors to this spring. Tsumcor: Busy waterhole. You should see plenty of animals here. Good photography. Twee Palms: Picturesque, Makalani Palms, don’t miss the closing gate at Namutoni. 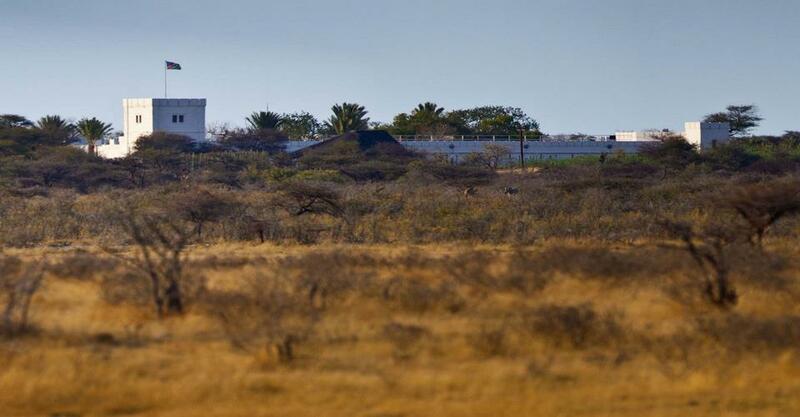 RATES INFO: Game Drive Times in Etosha National Park. The Morning drive is from 06h00 -9h00 three hours. Afternoon drive from 15h00 -18h00 three hours. Night drive from 20h00-23h00 three hours.